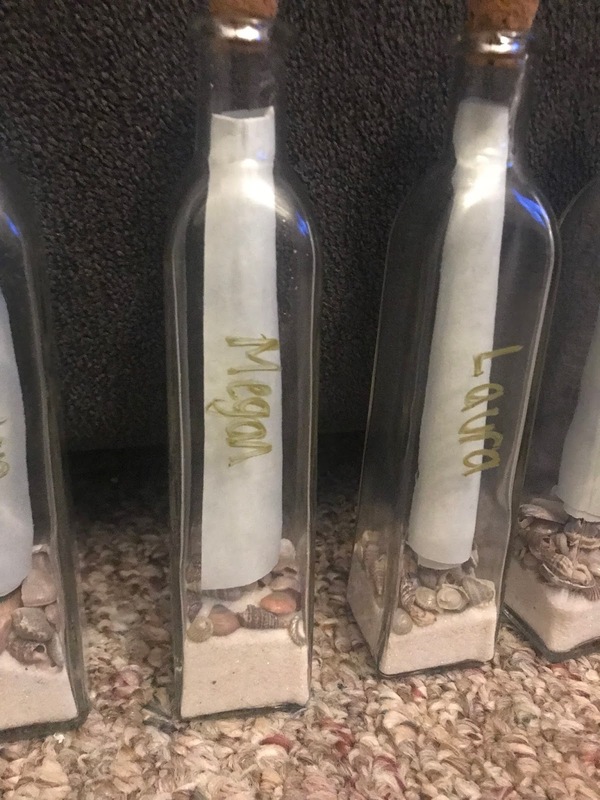 Now that I've officially asked all my bridesmaids to be in the wedding I can share all the details of my bridesmaid proposals with you! Since the theme of our wedding is the beach I really wanted to incorporate something beachy during my bridesmaid proposals but I wasn't sure what. Between Pinterest and Etsy there are a million ideas out there and honestly it can be quite overwhelming. I knew I didn't want to spend a ton of money because I'd prefer to spend more later on the gifts I give them at the rehearsal dinner then upfront on a proposal. I also liked the idea of getting crafty and making something. 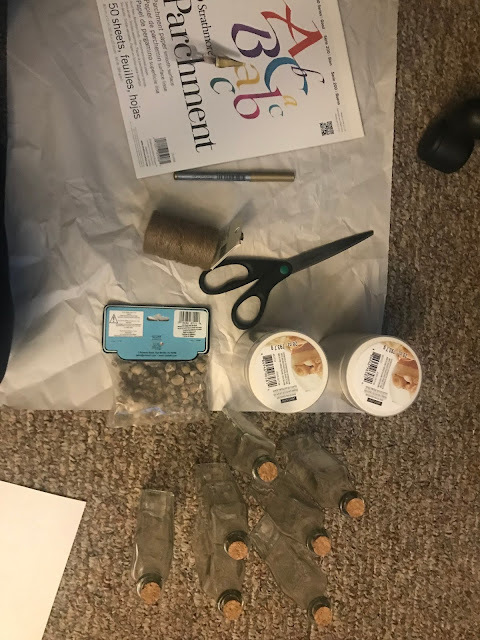 I came across an Etsy shop that sold messages in a bottle and thought that it was a great idea and would be easy to do myself- so I immediately headed to Michaels to pick up some supplies. 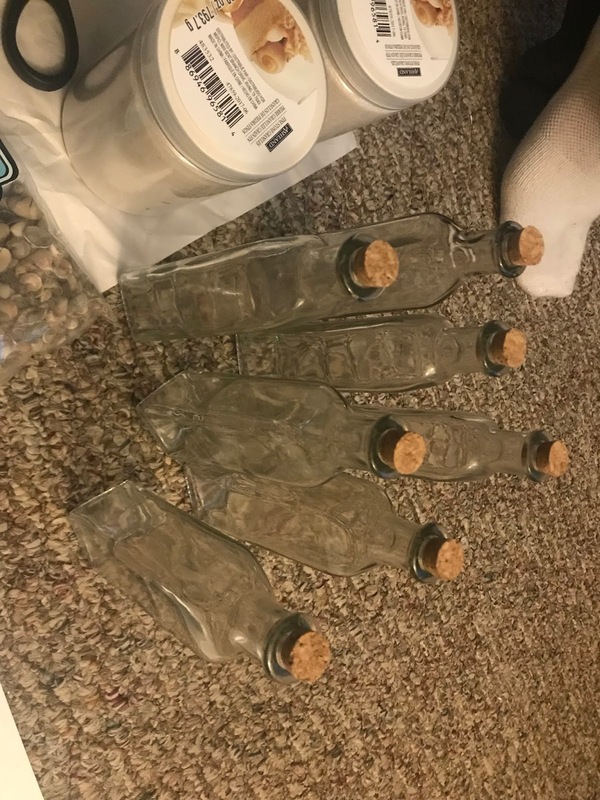 I picked up 7 bottles with corks, a book of parchment paper, two bottles of sand (I only ended up using part of one-but have plans for other crafts where I will use it all! ), a metallic marker, and twine (which I ended up not using). Sorry these pictures are sideways- that's pure laziness on my part- I'm the worst blogger. I filled each bottle with a little bit of sand and then (in my nicest handwriting) wrote notes to my Matron of Honor and each of my Bridesmaids. 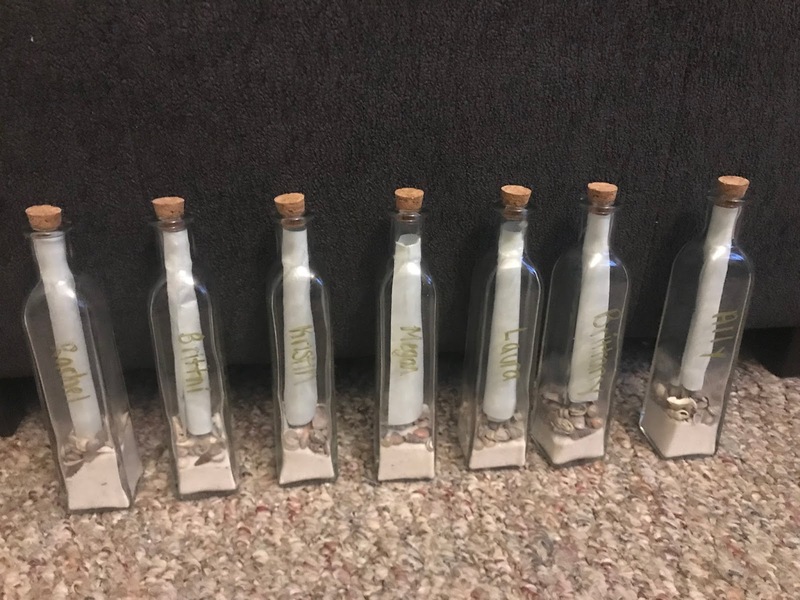 I also had purchased cards off of Etsy before deciding on doing the message in the bottle- so I kind of asked them twice- but it turned out fine! So who did I ask? Well I'll tell you! 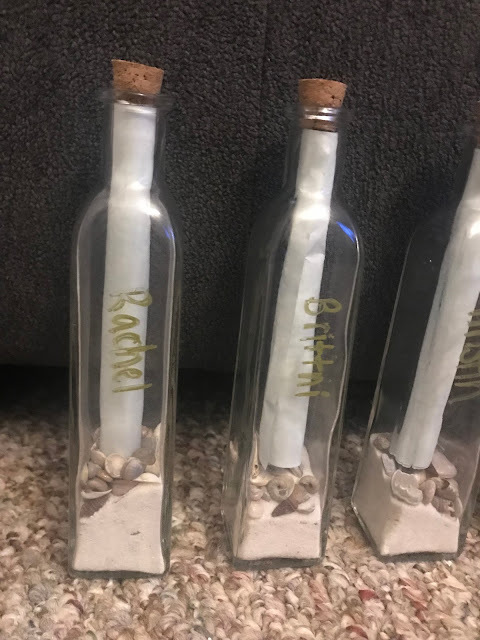 My matron of honor will be my best friend Rachel! 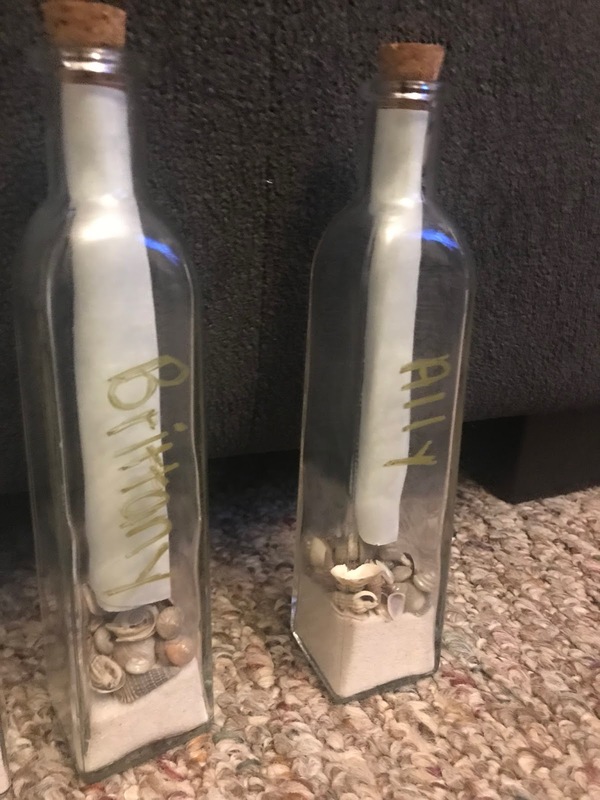 She said yes when I surprised her at work with her card and message in a bottle. If you've been reading for awhile you might remember that I was her maid of honor a few years back! My other best friend Brittni said yes to being a bridesmaid (and our officiant- she is doing double duty!) when I left her gift on her desk at work! Well actually she asked me what day we were getting married because she was real busy.... but in Brittni's sense of humor that was a yes! Kristin and I have been friends since my freshman year of high school. She and I danced together for four years in high school and then kept in contact for all these years- we still have dinner together quite often and I'm so excited for her to be a part of our day! Megan and I became friends through dance company at URI and immediately realized we were freakishly similar! I call her my twin because we both like the same things and have so much in common. We were also roommates our senior year of college! We've stayed friends through all these years and she will traveling all the way from San Diego for our wedding! Laura and I became friends my junior year of called through URI Dance Company and then became roommates my senior year! We had the best time living together and have continued our friendship since. We bonded over our love of dance and had many great nights in college! Brittany is Tim's sister so I have known her since the first month of our relationship. Tim and I wanted to make sure all of our siblings got included in our special day and I'm so excited to now have a sister since I've never had one before! Last but not least is Ally! She is Tim's cousins girlfriend and we've become friends through them. The four of us hang out quite often and over the last couple of years have had lots of fun times! Her boyfriend Derek will be Tim's best man and I'm so excited to have both of them be a part of our day!